The Indie Games Winter Uprising might not have blown any doors off of Xbox Live, but it has been a successful venture. In mid-November, 14 Xbox Live Indie Games developers banded together for the Winter Uprising, a promotion designed to show Xbox 360 users that the XBLIG store could provide great games for as low as $1. While the Uprising's chief, Robert Boyd of Zeboyd Games, says that it hit some snags along the way, overall he feels positive about it. All 14 games were technically meant to be released in the first week of December, but that became impossible because of how releasing a game on XBLIG works. Speaking to Edge, Boyd revealed that only 9 of the 14 have been released so far for a "number of reasons" that include "a bug found at the last minute, an incorrectly checked feature on the game description, or just plain not being finished yet." To get a game released on the XBLIG store, Boyd says that developers can only control when they submit their game. Once it's approved, the game automatically goes up on the service 48 hours later. If the game happens to have a bug or an issue, no matter how big or small, developers must wait a minimum of 7 days before resubmitting, which is likely a frustrating process when trying to get a product out within a specific time period. The Winter Uprising launched with the release of Epic Dungeon, an enjoyable roguelike-ish RPG priced at $1, which Boyd divulges sold approximately 6,000 copies in 10 days. This should be considered a success as a game created by a one-man, virtually unknown developer, and Boyd predicts potential sales of 50,000-100,000 over Epic Dungeon's lifetime. Other titles released so far in the promotion haven't done quite as well, such as Break Limit which has sold about 400 copies so far. 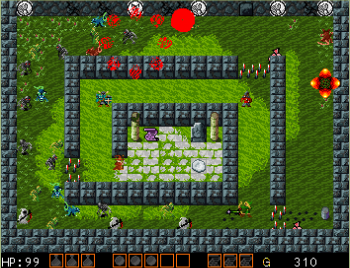 One of the bigger releases in my mind that just came out on December 13 was Soulcaster II, the second game in the tower defense/Gauntlet mashup, so it'll be interesting to see how that does in addition to Boyd's own Cthulhu Saves the World and Ska Studios' ZP2KX: Zombies and Pterodactyls. Boyd is still optimistic about the promotion, because he feels it has drawn a lot of "positive attention" to the Xbox Live Indie Games platform. Though I liked Epic Dungeon, admittedly it has been the only game I've tried so far in the Winter Uprising. Nobody should be averse to the idea of cheap, fun games, so I like that the effort is at least being made here. The full list of releases in the Indie Games Winter Uprising can be found here.